A 1965 Thanksgiving dinner at the former church where Alice Brock and her husband Ray lived inspired Arlo Guthrie’s ballad of his arrest and subsequent draft board rejection for illegally disposing of trash. But “Alice’s Restaurant” also created vibrations so strong they imbued Alice’s whole career as a restaurant proprietor. 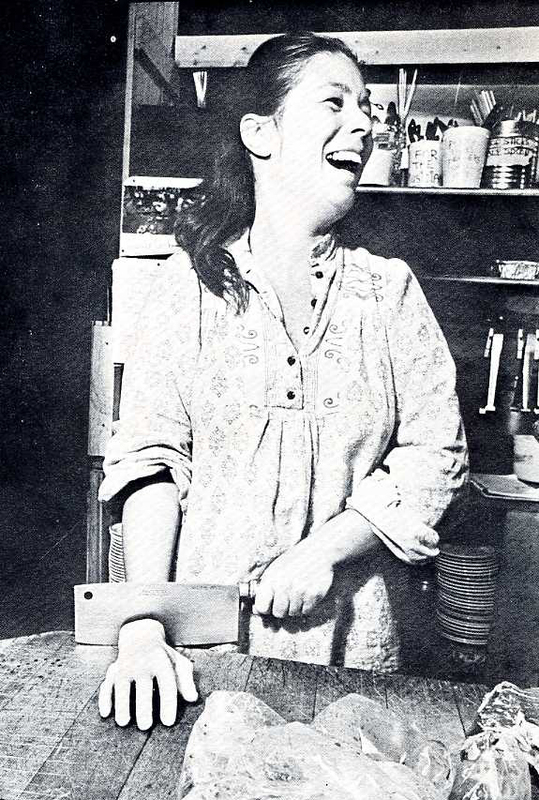 Although she enjoyed a degree of success, her career was also filled with disappointments such as a nationwide chain of Alice’s Restaurants and a TV show (Cookin’ with Alice) that did not materialize. 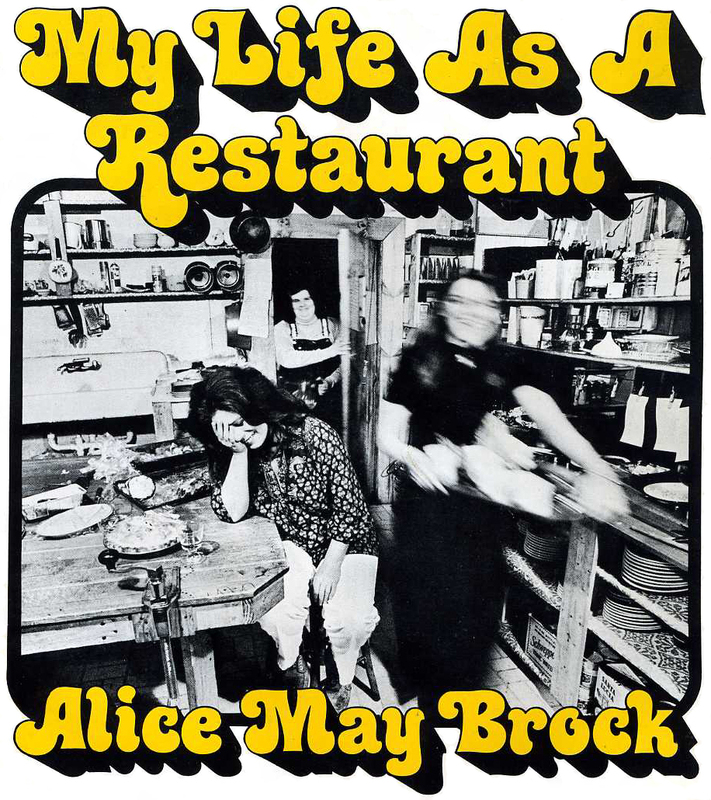 In April 1966 she opened the first of her three restaurants, The Back Room, in an old luncheonette in Stockbridge which Alice described as “painted two-tone institutional green, and … definitely not the kind of place where I would eat, much less own.” Alice ran it for one year before she “freaked out” and closed it. In her book My Life as a Restaurant, she declares, “I didn’t know what I was going to do, but I knew I would never have another restaurant.” Not so – she would have two more. After a year as consultant on the Arthur Penn movie built around Guthrie’s song, Alice decided to try again. But now she was a counterculture celebrity, portrayed in the film as a “dope-taking, free-loving woman,” a depiction which she insisted was false but which would bedevil her relations with town authorities whose approval she needed to open or expand a restaurant. She would tussle with the town of Stockbridge throughout the four years she operated her second restaurant, “Alice’s.” Located in a semi-ramshackle former liquor store on Route 183, it began in the summer of 1972 as a roadside stand called “Take Out Alice.” Partly because of her celebrity and partly because she provided superior roadside fare – sushi, borscht, salmon mousse, and cream cheese & walnuts on homemade bread – she attracted volumes of summer visitors. The next year she was granted permission to add a small dining room, but further expansion requests were denied, leading her to move the restaurant to Lenox, near Tanglewood, in 1976. In 1979 she closed Alice at Avaloch (shown below), the Lenox restaurant-plus-motel, after difficulties with the property’s sewage system and other adversities, permanently ending her restaurant career. Henri Maillard came to New York City from France in the 1840s bringing with him a bit of Paris represented in the pots and pans and fancy moulds he used as a chocolatier. 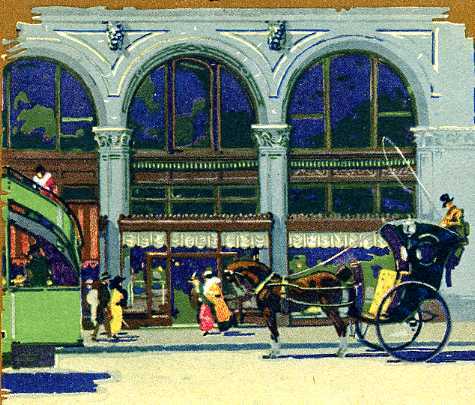 It wasn’t long before he added a catering department to his confectionery at Broadway and Houston. He let the public know he was ready to produce meringues, Charlotte Russes, jellies and ice creams for balls and parties, as well as provide dinners by reservation on his premises. His fame spread beyond New York, leading him to cater an inaugural ball and grand dinners at the Lincoln White House. In 1878 he took the gold medal at the Paris Universal Exposition at which he exhibited solid chocolate statues and vases weighing from 100 to 180 pounds each and a catalog of 3,000 candies. When he died in 1900 at age 84, his estate was valued at $2 million, a vast fortune at that time. His son Henry Maillard Jr. continued the business, moving the fashionable restaurant and candy store in 1908 from the lower level of the Fifth Avenue Hotel, its home since the early 1870s, to more luxurious quarters at Fifth Avenue and 35th street (pictured). By this time Maillard’s had long enjoyed a reputation as the premier restaurant of society women. 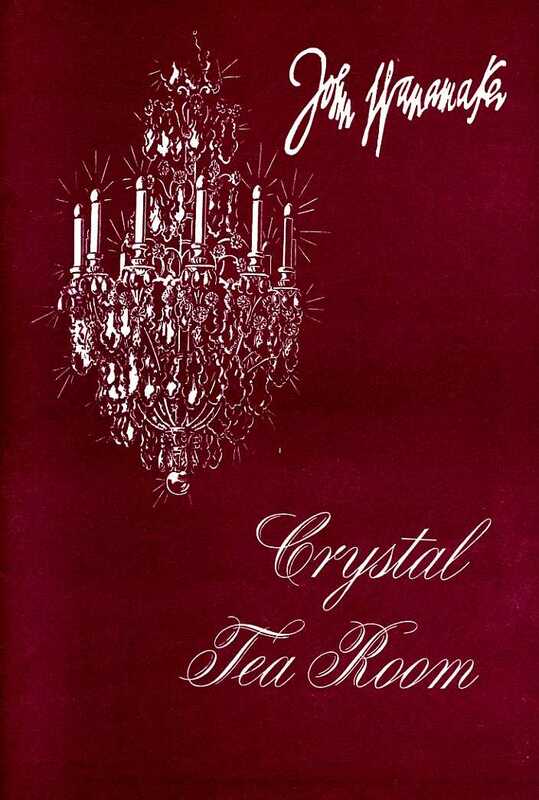 Billing itself as “An Ideal Luncheon Restaurant for Ladies,” it also offered afternoon tea from 3 to 6 p.m. 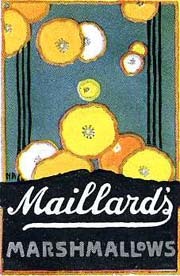 In 1913 Maillard’s opened a branch in Stern’s Department Store. 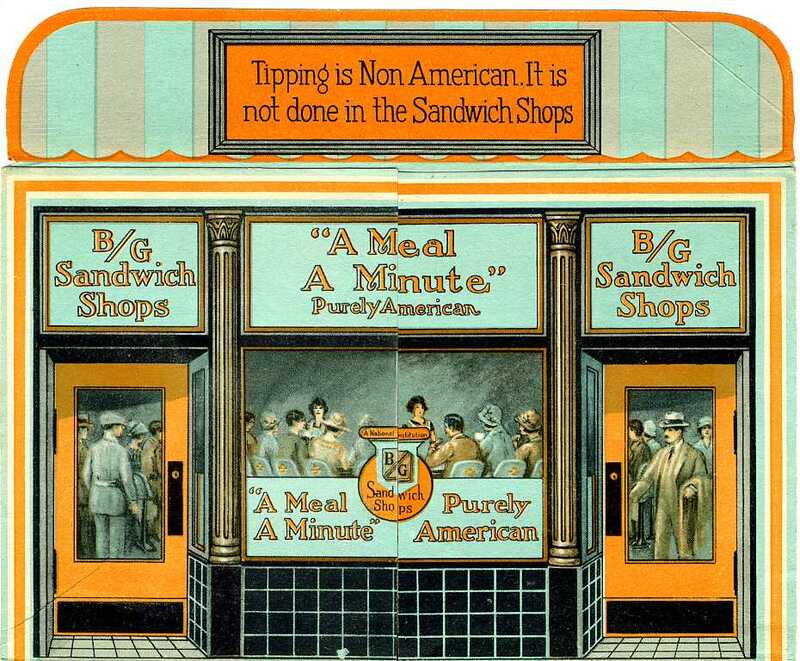 In 1922 Maillard’s made another move, this time to Madison Avenue at 47th street. At this address it added something new, a dining room for men with its own entrance separate from the larger women’s dining room. 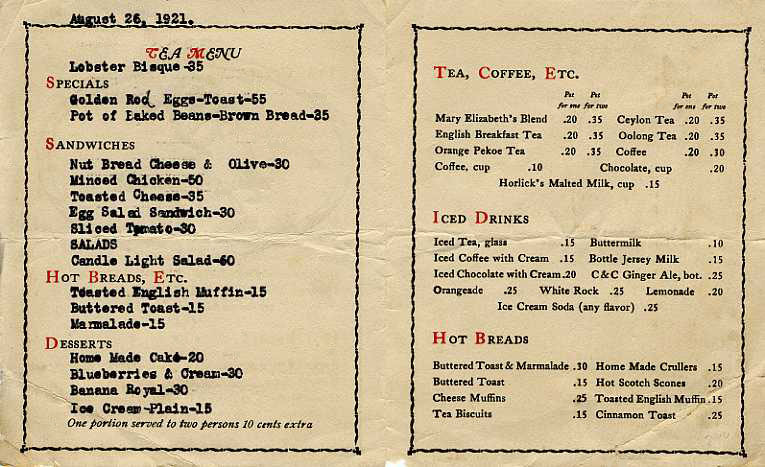 It was undoubtedly this location which attracted the patronage of James Beard, who would later write, “In the ‘twenties in New York, you’d have a good cup of Maillard hot chocolate and a chicken sandwich for 75 cents and you thought you were whirling through the world.” In the 1920s there was also a Maillard’s restaurant and store on Michigan Avenue in Chicago where patrons lunched on delicate sandwiches of cream cheese and white cherries. During the Depression Maillard’s failed. 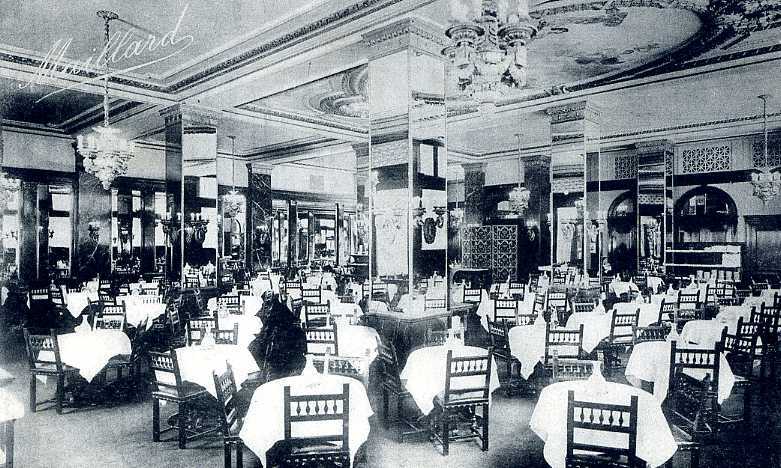 The Chicago location was taken over by the Fred Harvey corporation as its first non-railroad restaurant, while a syndicate took over the New York location and the Maillard’s name. Although Maillard’s candy was produced until the 1960s or later, the restaurant at Madison and 47th, which advertised mundane economy lunches of corned beef, veal cutlets, and chopped ham sandwiches during the 1930s, closed in 1942. Mary Elizabeth Evans, for whom the landmark tea room was named, began her career in 1900 at age 15 as a small grocer and candymaker in Syracuse. After one year in business she cleared the then-handsome sum of $1,000 which she contributed to the support of her family while supervising a growing crew of helpers which included her two younger sisters who served as clerks and her brother who made deliveries. Her family, though in seriously reduced circumstances, had valuable social connections. Her late grandfather had been a judge, her uncle an actor, and her departed father a music professor. That may help explain how she achieved success so rapidly – and why her story garnered so much publicity. By 1904 several elite NYC clubs and hotels sold her candy and soon thereafter it was for sale at summer resorts such as Asbury Park and Newport and in stores as far away as Chicago and Grand Rapids. 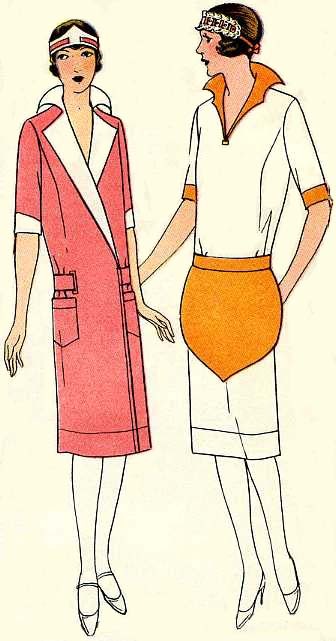 In 1913 the all-women Mary Elizabeth company, which included her mother and sisters Martha and Fanny, was prosperous enough to sign a 21-year lease totaling nearly $1 million for a prestigious Fifth Avenue address close to Altman’s, Best & Co., Lord & Taylor, and Franklin-Simon’s. 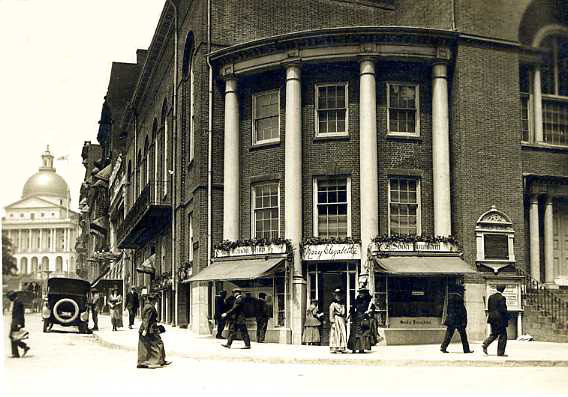 By the early teens the candy store had expanded into a charming tea room with branches in Newport and two in Boston, one on Temple Street and the other in the basement of the Park Street Church near the Boston Common (pictured ca. 1916). Like other popular tea rooms of the era, Mary Elizabeth’s bucked the tide of chain stores and standardized products by emphasizing food preparation from scratch. Known for “real American food served with a deft feminine touch,” Fanny Evans said the tea rooms catered to women’s tastes in “fancy, unusual salads,” “delicious home-made cakes,” and dishes such as “creamed chicken, sweetbreads, croquettes, timbales and patties.” For many decades, the NYC Mary Elizabeth’s was known especially for its crullers (long twisted doughnuts). Mary Elizabeth distinguished herself as a patriot during the First World War by producing a food-conservation cookbook of meatless, wheatless, and sugarless recipes, and by volunteering to help the Red Cross develop diet kitchens in France. After her marriage to a wealthy Rhode Island businessman in 1920 she apparently played a reduced management role in the business. In its later years the NYC restaurant passed out of the family’s hands and began to decline, culminating in an ignominious Health Department citation in 1985. 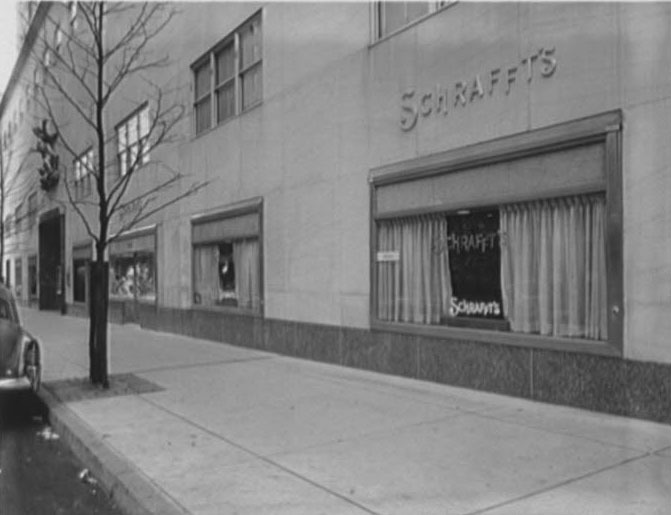 Schrafft’s began as a candy manufacturer in Boston but over time morphed into a well-known restaurant chain. In 1898 Frank G. Shattuck, a salesman for the Schrafft company from upstate New York, opened a candy store at Broadway and 36th in New York. His sister, Jane Shattuck, was largely responsible for the introduction of light lunches into the stores. 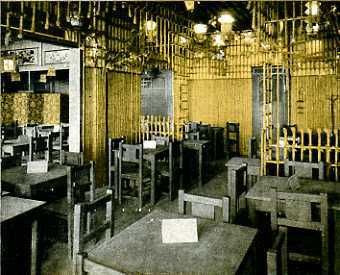 The first to serve food was the Syracuse store in 1906 where a “Japanese Tea Room” (shown here) was boldly advertised as “the daintiest luncheon spot in all the State.” By 1909 Jane also introduced meals to the second NYC Schrafft’s, at 54 West 23rd Street in the heart of a thriving shopping district. By 1927, when there were 25 units, most located in NYC, the Wall Street Journal estimated that around 75% of Shattuck’s business was in the restaurant trade, with the rest candy-related. Schrafft’s was known for reproducing an air of gentility typical of the upper middle-class WASP home. Cooks, supervisors, and even some executives were women. 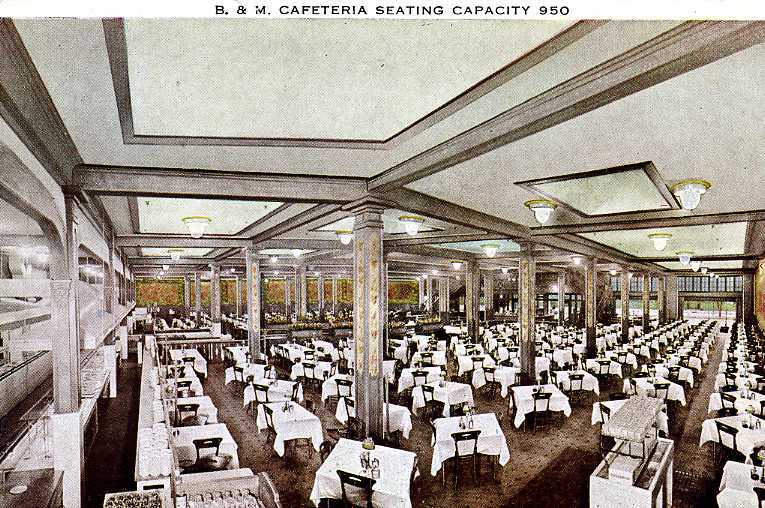 Menus of the 1920s and 1930s included many salads, more desserts than entrees, and non-restaurant-y vegetable selections such as creamed cauliflower and fried eggplant. Frank claimed Schrafft’s cuisine was inspired by his mother’s cooking. 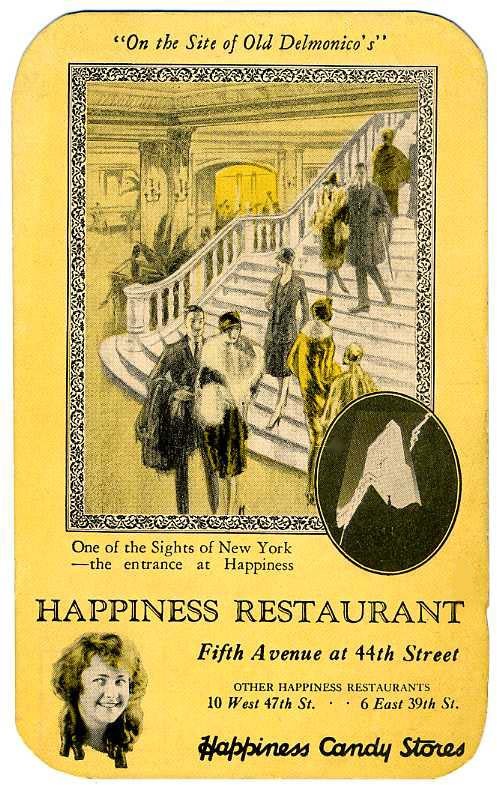 Repeated efforts to overcome connotations of a “women’s restaurant” and attract men met with disappointing results despite customers such as James Beard. Women dominated even after some units began to serve cocktails in 1934. Rent cuts in the depression encouraged chain expansion and by 1937, when Frank died, there were 43 Schrafft’s, most in metro NYC but a few in Boston and Philadelphia. At its peak there were about 50 units in greater NYC. In 1961 the chain played briefly with the idea of selling frozen dinners on the roadside. In the late 1960s the Schrafft’s candy company was sold to Helme Products while Pet, Inc. took over the restaurants. 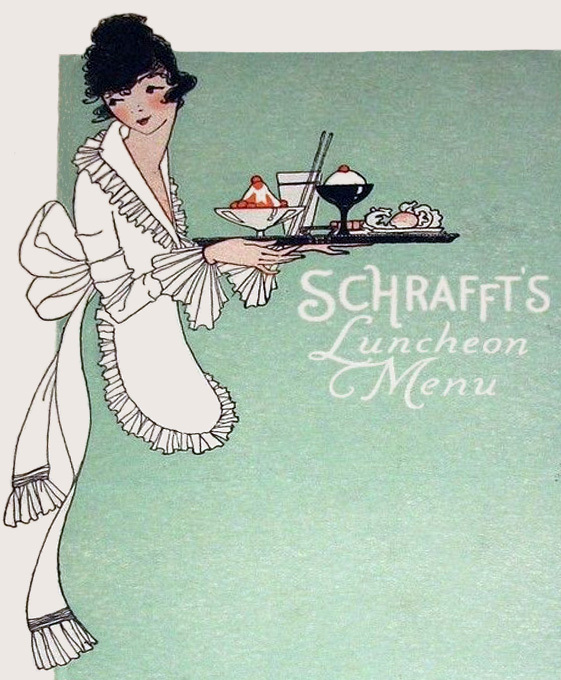 Pet made a renewed effort to renovate Schrafft’s image and attract men. At the Fifth Ave location (between 45th & 46th) the soda fountain was removed and a bar installed. 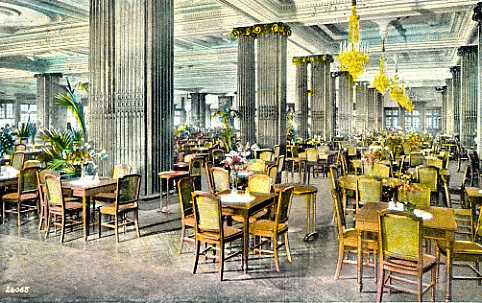 The second floor, men-only dining room was given dark wood paneling, zebra-stripe carpeting, and named “The Male Animal.” The 1970s saw confusion as a Schrafft’s opened in Los Angeles (sporting a Chinese room and an Elizabethan room), new ownership took control, and numerous NYC locations were shut down. In 1981 the candy company ceased while the few restaurants remaining were in various hands.